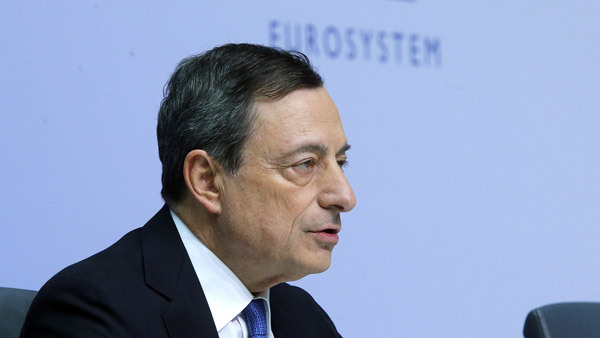 What keeps European central bankers awake at night? Worries about their American colleagues. But the Fed’s transatlantic cousin, the European Central Bank, has just issued its biannual Financial Stability Review, and despite the soothing name, the report has plenty of fodder for the investment industry’s professional worrywarts. Weighing in at 173 pages, the tome starts off promisingly enough with the placid assurance that Eurozone financial conditions have been calm over the past half year. In other words, asset prices are rising sharply, even though the economic fundamentals lag, leading to a “medium-level systemic risk” that would ensue from an “abrupt reversal” in global asset prices. “In particular, a faster than expected withdrawal of U.S. monetary policy accommodation harbors some potential to translate into higher risk premia, even in the euro area,” says the report. This brings us back to that dichotomy between a hot market and cold economy. The economic recovery is described as “still fragile” even seven years after the height of the global financial crisis, and has magnified another dichotomy in Europe’s banking sector. The ECB report identifies a third lower-level “potential systemic risk” regarding the sustainability of sovereign and corporate debt amid persistent low growth. The ECB identifies a rapidly growing shadow banking sector as the fourth and final potential systemic risk. Though this risk is seen has having less impact than a reversal in asset prices, the ECB views shadow banking contagion vulnerability to have increased the most since its previous November report. While banks have muddled along since the financial crisis, the investment fund sector has shot up more than 70% from 2009 to 2014. The ECB worries about “amplification effects” of this growing sector’s response to triggers such as an asset price reversal. Check out Data Breach Rocks IRS on our sister site Legal Tech News.